Recently, I found a 2 lb bag of Gala apples at the bottom of the crisper drawer. They were slightly bruised, slightly wrinkly, and immediately dismissed by the boys as suitable afternoon snacks. But what looked like trash was an inspiration for treasure. This recipe comes directly from the the oh-so-adorable Donal Skehan. I was scrolling through Instagram one morning and his Irish apple cake appeared into my life. I could literally smell the cinnamon right through the screen. And then I thought: no one would ever know if I tucked the bruised apples into the batter! As per Donal’s instructions, I used my electric mixer to combine the ingredients. You could also use a stand mixer or even do it by hand, but the batter is on the stiff side so I’d bust out the appliances if you have one. 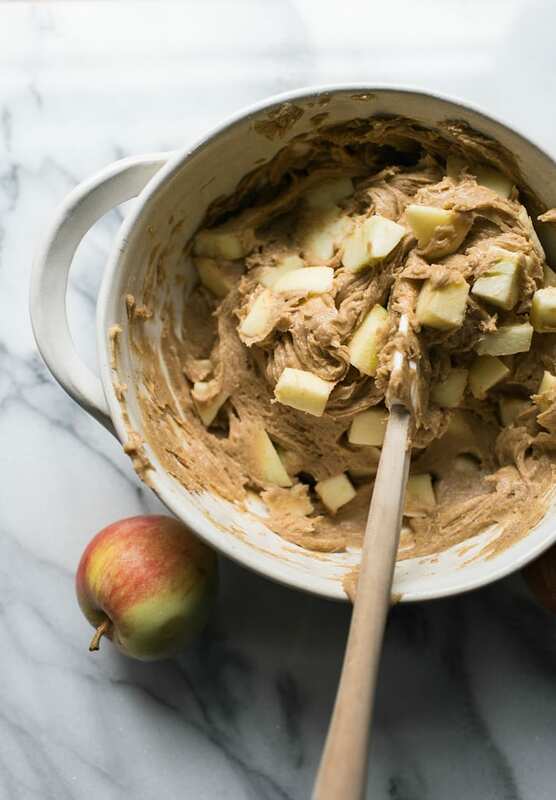 In fact, don’t worry about the stiffness of the batter during the initial mixing phase; the moisture from the chopped apples fluffs up the cake when baked. I think I added even more apples because I was eating half of them as I went along! The only thing I changed was the crumble topping. I used my recipe for “Convenient Crumbles’ from my book (pg.79). It’s basically a mixture of butter, sugar flour and oats combined into crumbles for dessert. What makes them convenient, is storing the crumbles in the freezer so they’re at the ready any day of the week. Can you smell the cinnamon yet?! This recipe creates a simple yet humble cake, that certainly hits the spot. Go make yourself some coffee and light a pumpkin candle- enjoy! You can find the original version here, by Donal Skehan. Note: I used a standard 9-inch springform pan for this cake, although the original recipe calls for a 7 or 8-inch pan. Adjust your baking times to suit the size of your pan. Preheat your oven to 350°F. Coat the inside and sides of a springform pan with butter and a sprinkle of brown sugar. In a large bowl, cream the butter and sugar together using an electric mixer, about 1-2 minutes. Add the eggs, one at a time, and continue mixing until fully incorporated. Add the flour, baking powder, salt, and cinnamon. Mix gently to combine- the batter will be thick. Fold in the apples. 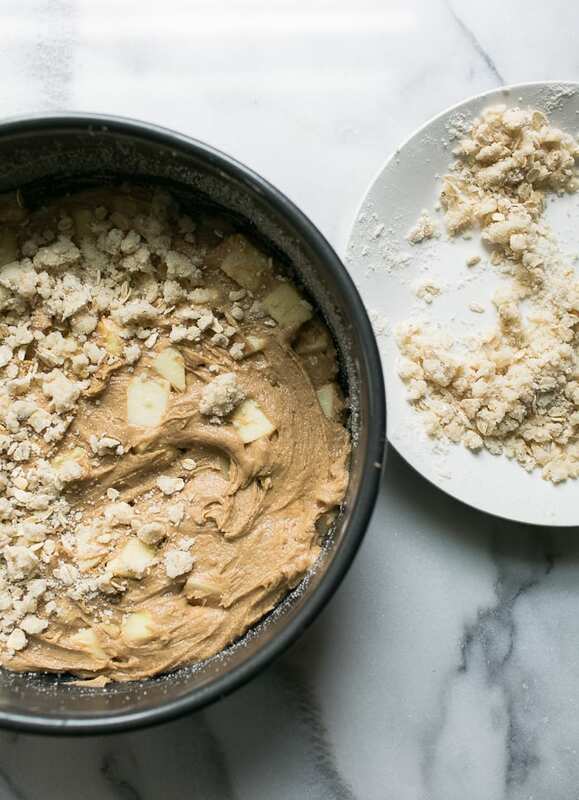 For the crumble topping, add all of the ingredients into a small bowl. Mix with your fingers until small crumbles start to form. Scatter evenly over the top of the cake. I think that the slightly banged up fruit makes for the best baking. This looks like a great early fall cake- suitable for snacking, dessert, and breakfast all in one. I can never be quite happy about the Fall, as I know too well what comes after that, but it IS a great season for cooking! I don’t mind bruised apples one bit, but baking with them is ALWAYS a fun idea!! Love this cake friend! Great idea, I’ve got a couple of apples that I need to use up. And I agree, this would be great for breakfast. Thanks! 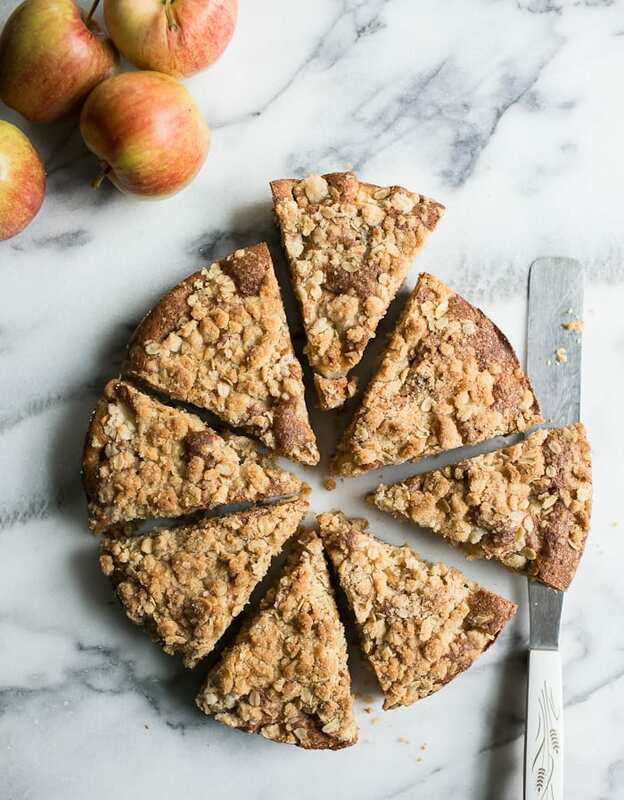 I love a good apple cake and that crumble topping looks heavenly! Making it right now with delicious home grown apples. House smells like fall. Lovely recipe Emilie! I baked this cake yesterday and it was delicious. It was a beautiful cake, and it was the perfect fall weather snack. I used a couple of Gala apples, and added a few oats to the crumb topping. Wonderful! I made this this morning and it was absolutely delish!!! Great recipe. I also added a few oats and sliced almonds to the crumb topping. It was way too yummy!!! I made this over the weekend and it was delicious. 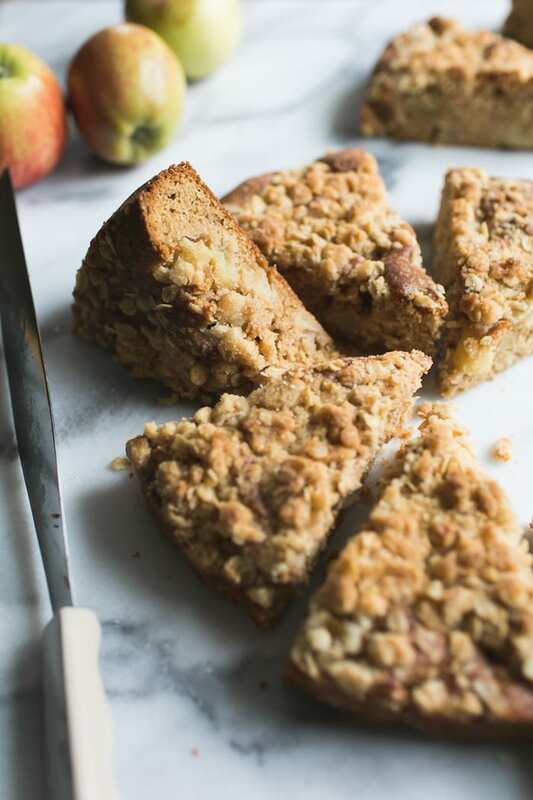 I used a honey crisp apple and the cake is so versatile, it has been served as a coffee cake warm with coffee in the morning to the evening with ice cream and applesauce warmed and drizzled over the cake. Perfect to serve when you have company at Thanksgiving or Christmas in the morning when you are preparing the feast. Thanks so much for the feedback. 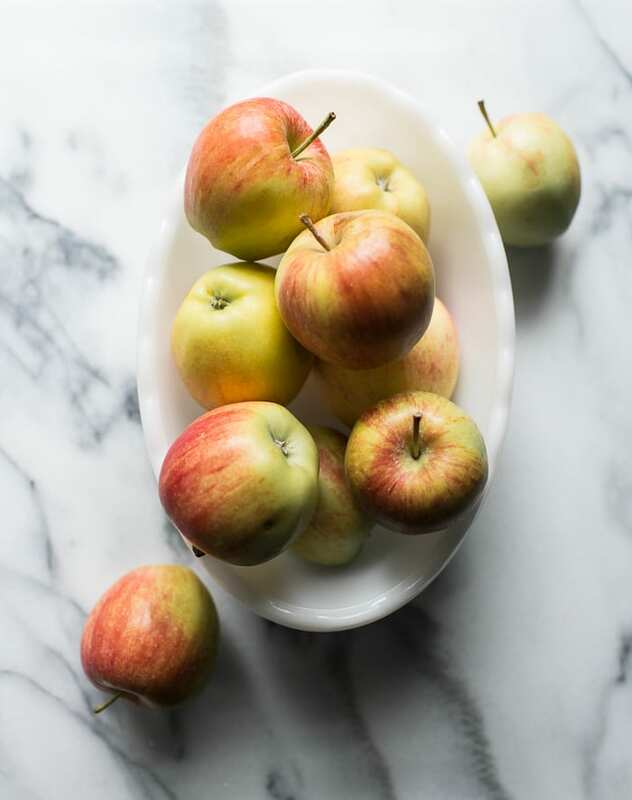 Honey crisps are some of my favorite apples, and I’ve haven’t had one yet this season! I’m glad you enjoyed the cake- it’s super simple yet nice enough to serve for guests. So thrilled it’s apple season! Can’t wait to make this.